Ours is a strange world indeed when Shane Warne, Taylor Momsen and Robert Falcon Scott can all have something in common. All are, in one way or another, role models. These figures are however nothing more than a degustation menu of expected inspiring figures. Selected from just three zones of achievement valuable to society – sport, meritless fame and reckless adventure seeking – there are many others just like if not identical to them ready to take their place when or if they make their final and most spectacular fall. Another more durable option is required to quell the thirsts of today’s herdlike youth for emulation and adoration. 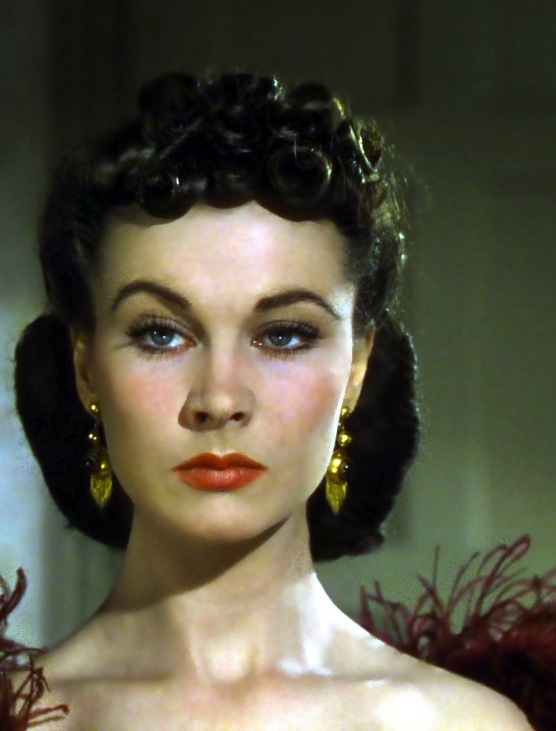 Scarlett O’Hara (Vivien Leigh), veritable anti-heroine of Gone with the Wind (1939), is one such suggestion. Indeed, it is almost impossible to adequately describe the particular type of contempt and selfishness with which Scarlett conducts her business on a daily basis. Arguably, the institution of marriage is yet to be wielded by another so admirably and cruelly as she does throughout the FOUR WHOLE HOURS of Gone with the Wind. She and her renegade eyebrow possess the whim and capacity for destruction equal to that of a small volcano. Those in her way are mercilessly swept aside and those who wrong her callously punished. Even family members are not spared from her own brand of scorn and psychological torture. Whilst this selfishness and complete disregard for the physical and psychological condition of those who just so happen to find themselves within a few miles radius of her magnificent presence is indeed a fascinating character study, it is not grounds for her to be considered a role model. Were this the case, Venus Fly Traps, Botulism or the Tchernobyl catastrophe would also be worthy of veneration. Never fear, Scarlett does actually possess some traits that recommend her to fellow humans. It is not being suggested that the youth of today would treat a sociopath as the pinnacle of all that is good and proper. Scarlett’s story, opening to an idyllic glimpse of the utopian lifestyle of the American Deep South, is one of perpetual ‘struggle’. Spoilt to say the very least, the luxurious lifestyle to which she is accustomed is very soon snatched from her as the realities of the Civil War gradually encroach upon her world. Very soon she finds herself without a husband, without a father, without a plantation and in very dire danger of foreclosure. An onslaught of woe such as this would be the end of many individuals but it is a mere hurdle for Scarlett. Eager to regain her insipid lifestyle, she claws back the family fortune plant by plant, later goes into business with her second husband and when he dies finally gains access to the hefty coffers of the unweddable Rhett Butler (Clark Gable) by doing the unthinkable: marrying him. Reality for Scarlett is an interminable whirlwind of marriage and fortune grubbing and it is her frenetic pursuit of her goal that makes her worth our attention. It is very easy to condemn her for her for an overreliance on husbands in what appears to be a display of feminine impotency in the face of a cruel, capricious world. This is not so. It is doubtful that Scarlett properly loved any of her spouses. Each marriage was a crucial stepping-stone in her diabolical goal for world dominance – each husband, an odd variety of trophy. This imperviousness to the then essential institution of marriage cements her capacity to fascinate, as does the timelessness of Victor Fleming’s rendition of the classic novel. Strong female characters so purposefully out of sync with their social environs are nothing short of fascinating. To willingly defy her family, her peers and to boldly go where no woman has gone before is worthy of admiration. Scarlett joins the Elizabeth Bennetts, Lisbeth Salanders and the Pippi Longstockings of the world as an ambitious, determined and independent female heroine. Unfortunately, classics just aren’t as cool as they used to be, back before they were, well, classics. It is highly unlikely that the today’s large hoard of youth knows who Scarlett is, let alone why they should be inspired by her. Forced viewing, in the style of A Clockwork Orange (1971), might be a ready solution. Exposing one’s offspring to Scarlett is an investment indeed for any parent. She cannot leave the late nineteenth century, she cannot (like Miley Cyrus before her) mutate, and most importantly she cannot die. She’s the perfect role model. Great article! I must admit, “She and her renegade eyebrow…” made me laugh out loud. Love this piece Amy – I also love Gone With the Wind, and have seen it such an obscene number of times that it blows my mind that so few of my peers have seen it. It’s like I’ve used up their viewing rations. I think you’re right about Scarlett going an awesome role model though; it’s always going to be about context, and while a woman marrying for power and advantage might not be held in particularly high esteem these days (at least not in the circles I mix in), Scarlett did it at a time when women had far fewer resources to get ahead. But the fact that she was doing it for her land and her family means more than if she’d been doing it ONLY to live comfortably. Fantastic film, fantastic Vivien and a fantastic column! This entry was posted in Film and tagged celluloid relapse, gone with the wind, role models, scarlett o'hara. Bookmark the permalink.